Blackened, gutted and surrounded by rubble, Russia’s peacekeeping base sits atop a hill outside the South Ossetian capital of Tskhinvali, a burnt-out tank at the entrance. Inside, Vladimir Ivanov, an aide to the commander of the Russian peacekeeping force, stood by the ruins last week, telling his story as he gestured across the valley to where Georgian and Russian troops fought earlier this month. Captain Ivanov is one of a handful of people, some Russian, some Georgian and some American, whose recollections will determine how the history of this short war is written and, ultimately, whose actions can be vindicated. Which version prevails will be crucial in the next, more subtle phase in the conflict: the political and diplomatic battle in which the truth will be the primary weapon wielded by governments to achieve their aims. Tuesday’s decision by Russia to recognise South Ossetia and nearby Abkhazia – another separatist enclave that achieved de facto independence following a brief civil war in the early 1990s – makes clear that its aims in the region have changed little in 200 years. At stake today is Georgia’s external political orientation – whether it remains an outpost of Euro-Atlanticism or falls into Moscow’s sphere of influence once again. Washington, which stations 130 military advisers in Georgia, is anxious to see the country remain an ally and in April promised Tbilisi eventual membership of Nato, infuriating Russia. Both sides had an interest in escalating the conflict, say political analysts. Russia wanted to show that Mikheil Saakashvili, Georgia’s president, was an irresponsible firebrand who could not be trusted with the responsibilities of Nato membership. Georgia, meanwhile, wanted to paint Russia as the imperial aggressor it has traditionally been in the Caucasus, which would have strengthened Tbilisi’s case for Nato membership. Each can be seen to have acted swiftly, with a great deal of preparation, later trying to make their behaviour appear spontaneous. Mr Saakashvili, despite repeated denials, clearly drew first. But Russia was not far behind, indicating that Georgia’s president may have fallen into a well laid Russian trap. Mr Saakashvili has been widely pilloried for a drastic miscalculation in invading Tskhinvali on August 7, provoking the Russian incursion to defend the town’s citizens. He continues to insist that Moscow was to blame. “The first thing that happened was that the Russian tanks came in,” Mr Saakashvili told the Financial Times at the weekend. So far, the Georgian government has not been able to produce evidence to back up this claim. From Capt Ivanov’s hilltop vantage point it is possible to see almost the entire geography of the conflict as it unfolded. There is a view down to the rooftops of ethnically Georgian villages in the valley, where the first fighting erupted on August 1. In the distance is the Karaelti region, across the South Ossetian border into Georgia proper, where the first Georgian tanks appeared in the evening of the 7th. Most accounts agree that it was South Ossetian separatists who committed the first act of escalation when they blew up a Georgian military vehicle on August 1, wounding five Georgian peacekeeping troops. Georgia responded in kind, killing six South Ossetian militiamen, according to the account of a western diplomat who had been in Tskhinvali that week. As tension rose, Mr Chotchiev continues, they packed buses with women and children so tightly that there was barely room to stand. The buses drove down the treacherous road north, across the Russian border to Vladikavkaz. Following a short lull in the clashes, deadly fighting started again on August 7, each side blaming the other for the escalation. Heavier and heavier weapons were used. “One side would use a 60mm mortar, the other side would use a 90mm, then the 122s came out” was how one western observer put it. Capt Ivanov, however, says it is not possible that the Ossetians began firing rockets on Georgian villages first, as Mr Babirua had claimed, because the Russian peacekeepers had been confiscating all the South Ossetians’ artillery under a special programme. Whoever broke the ceasefire, fighting on both sides continued, according to witnesses. At about 9.30pm, Capt Ivanov says, Russian peacekeepers saw columns of Georgian tanks moving towards Tskhinvali from the south. Capt Ivanov says Mr Kulakhmetov phoned the Georgian representative on seeing the tanks, speaking for about 15 minutes to express his concern. At about this time, South Ossetian and Russian officials say, Georgia’s peacekeepers, stationed in South Ossetia alongside their Russian counterparts, suddenly vacated their posts, along with monitors from the Organisation for Security and Co-operation in Europe. “They all knew that Georgia was preparing a storm”, says Mr Kokoity. The OSCE denies it had any foreknowledge of the attack, calling the claim “total rubbish”. Virginie Coulloudon, an OSCE representative, insists that its monitors remained at their posts until Friday August 8, when they were evacuated. 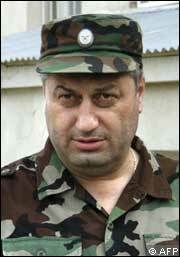 Capt Ivanov, however, agrees with Mr Kokoity that the Georgian peacekeepers and the OSCE staff withdrew at that time. The Russian peacekeepers hastily held a press conference to announce the movement by Georgian forces. “We had only just turned off the camera lights when the first shots were fired from heavy artillery. It was 23.30” says Capt Ivanov. It was at this time that some of the least understood events, and most wildly divergent accounts of the conflict, take place. 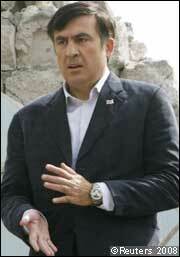 Mr Saakashvili insists that he ordered the assault on Tskhinvali that night only after he learnt that Russian forces had invaded Georgia, through the Roki tunnel from Russia to the north. Russia, however, denies moving troops or artillery through the tunnel until after the Georgians opened fire. Matthew Bryza, a State department official who is considered the US point man on Georgia, corroborates Mr Saakashvili’s version of events. He says he was told the same information, as events were unfolding, in a series of phone discussions with Georgian leadership on August 7 and 8. “I was in fact told that Russian armour was indeed already moving toward the Georgian village of Kurta from the Roki tunnel before the Georgians attacked Tskhinvali,” he says in an email. However, Mr Saakashvili’s account of this sequence is seemingly called into question by the public statements of his own senior military staff. At 11.05pm local time, General Mamuka Qurashvili, the chief of peacekeeping operations at the Georgian defence ministry, made a nationwide televised broadcast, announcing the end of the ceasefire and the beginning of a massive Georgian operation against South Ossetia. But he did not mention the presence of a Russian invasion force, instead saying the target of the operation was South Ossetian insurgents. “Despite our call for peace and a unilateral ceasefire, separatists continued the shelling of Georgian villages. We had demanded that that they sit at the negotiating table but all of this was met with a backwards reaction and there was constant shooting. The Georgian power-wielding bodies decided to restore constitutional order throughout the whole region,” he said, according to a translation of the broadcast by BBC Monitoring. Mr Saakashvili denied in an interview with the FT on Saturday night that the operation was aimed at “restoring constitutional order” or that he had ever used those words. Gen Qurashvili, who was badly injured in the conflict, could not be interviewed to clarify what he meant and whether, as he had said, the decision was made by “Georgian power wielding bodies”. Starting at 11.30pm that night, Georgian mortars, then rockets, then heavy 122mm Grad missiles fired from truck-mounted launchers pounded Tskhinvali. The bombardment killed dozens, perhaps hundreds, of civilians over the next few days, though it appears that early Russian estimates of 1,500-2,000 dead were exaggerated; as of last week a Russian special commission had confirmed 133. At 6am, Russian peacekeepers say, Georgian tanks began to storm the city. At least 15 Russian peacekeepers were killed by Georgian fire, while many were wounded, says Capt Ivanov. The Kremlin’s reaction was swift. Russian warplanes began bombing Georgian forces on August 8 and Russian ground troops swiftly arrived in South Ossetia. Again, however, controversy surrounds the timing of this intervention. The official version, according to a Kremlin press release on August 19, says that, “in accordance with the right to self-defence, on the afternoon of August 8, Russia sent additional forces to South Ossetia to support Russian peacekeepers and protect civilians”. However, Russian soldiers interviewed say they were on the road to South Ossetia long before the afternoon of August 8, and some said they were crossing the border into Georgia in the early hours of the morning. One foot-soldier with the 58th army division, interviewed as his unit was withdrawing from a base in Runeti back to Vladikavkaz in Russia last week, said they headed from their base towards the Roki tunnel at 2am on August 8. A colonel from the 58th division, who did not want to be named, says: “We were called to react to alarm on the night of 7th. They had wanted to send us for field training in a different region. There was such an escalation of events that I cannot remember exactly when we entered the tunnel. We did not enter until after the Georgians had begun fighting.” Capt Ivanov says it took the Russian army two days to reach Tskhinvali and that by Sunday the last Georgian forces had withdrawn under the weight of the assault. However, Tskhinvali residents are almost unanimous in blaming the Georgians. Tina Zakharova, the duty doctor at the Tskhinvali hospital, says staff and patients had to hide in a stinking cellar during the bombardment. She points to the operating table in a corridor with blood on the walls. “The wounded sat here for five days,” she says. Georgians also have their horror stories. Russian jets pounded the Georgian military mercilessly as it withdrew and Tbilisi sued for peace. Bombs aimed at an army base outside Gori on August 9 missed their target, smashing into two apartment buildings and killing 15. On August 12, Russian warplanes dropped cluster bombs, banned by the Geneva convention, on Gori and the nearby town of Ruisi, killing at least 11 civilians, including a Dutch journalist, and injuring dozens more. Video footage of the strike is available on the Human Rights Watch website. 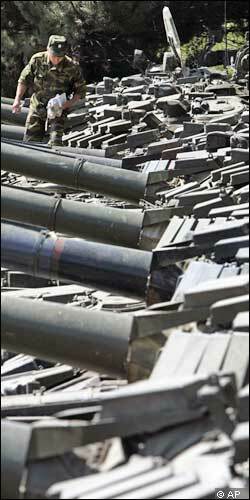 Russia subsequently denied any use of cluster munitions. Today, Georgia’s future hangs in the balance. Its army has been crippled and it is helpless in the face of Russia’s recognition of South Ossetia and Abkhazia on Tuesday, effectively splitting off 20 per cent of Georgia’s territory. For all his miscalculations, Mr Saakashvili remains popular – though his hold on power may be slipping. Ironically, the main thing keeping Georgians from turning against him is the presence of the Russian army. Will oil prices hit $145 again?